What are the Positive Effects of Garlic on High Blood Pressure? Home » Heart Health » Blood Pressure » Is Garlic Good for High Blood Pressure? Garlic is one of the most researched superfoods, and it said to be excellent for everything from cancer to infections and diabetes. Is garlic good for high blood pressure, too? Garlic and its various forms have been widely recognized in the treatment and prevention of heart diseases. Numerous studies suggest the fragrant herb could potentially prevent atherosclerosis, reduce cholesterol and triglyceride levels, inhibit platelet aggregation, and yes, lower high blood pressure. High blood pressure is also known as hypertension. It is one of the most important risk factors associated with heart disease. The condition affects about one billion people worldwide and around 75 million American adults—or one in three adults. This includes half the population over 65 years old. Hypertension occurs when the arterial walls narrow or thicken and this puts extra stress on the heart. From a clinical perspective, blood pressure readings measure the systolic (upper number) and diastolic (lower number) pressure on the blood vessel walls. The systolic refers to the amount of pressure when the heart contracts, and the diastolic pressure happens between heart beats. Stage 1 high blood pressure is characterized by a systolic pressure of 140 mmHg (millimeters of mercury) and a diastolic reading of 90 mmHg. Although garlic has many amazing health benefits, today, we will look at the effect of garlic on blood pressure. In addition, we will analyze the types of garlic you can use, as well as how much garlic you need to lower high blood pressure. Should You Take Garlic for High Blood Pressure? Garlic (Allium sativum) is well known for its chemical composition, and it contains about 33 important sulfur compounds that include allicin, ajoene, aliin, diallyl disulfide, diallyl trisulfide, vinyldithiines, S-allylcysteine, and S-allylmercaptocystein. Garlic also contains a number of minerals and vitamins, such as vitamin B6, vitamin C, selenium, manganese, iron, calcium, potassium, and copper. Garlic’s antihypertensive effect is associated with its antioxidant and bioactive sulfur content, especially allicin and S-allylcysteine. Several studies show the positive effect of garlic on blood pressure. One study published in the journal Maturitas in 2010 suggested that taking four capsules of aged garlic extract (960 mg) daily for a three-month period would cause blood pressure to lower by an average of 10 points. Other research published in the journal Integrative Blood Pressure Control in 2014 found that aged garlic extract could potentially lower blood pressure in hypertensive patients in a similar way to the standard blood pressure treatment. A systematic review and meta-analysis published in the journal BMC Cardiovascular Disorders in 2008 suggests that garlic preparations are more effective than a placebo for decreasing blood pressure in hypertensive patients. In some of the studies, powdered garlic was consumed in doses ranging from 600 mg to 900 mg each day, while the average study lasted between 12 and 23 weeks. Together the studies revealed that garlic would reduce systolic blood pressure by an average of 4.6 mmHg. In addition, in those with hypertension, on average, diastolic was reduced by 7.3 mmHg, while systolic was decreased by 8.4 mmHg. Although some of the studies last longer than 23 weeks, more research is needed to determine whether the effect of garlic on blood pressure can last for longer periods of time. What is the effect of garlic on blood pressure? Some research suggests that garlic lowers blood pressure by increasing blood vessel dilation and decreasing peripheral vascular resistance through its prostaglandin-like effects. Garlic also contains a compound called adenosine, which is a muscle relaxant that helps with vasodilation. Others believe that the antihypertensive effect of garlic may be associated with its ability to prevent the digestive system from turning fat into cholesterol. Garlic is consumed in various forms, including raw, dried, and cooked. There’s also garlic oil, garlic juice, extract, and aged garlic supplements. Garlic must be crushed, sliced, or chewed before cooking to ensure the maximum amount of allicin is produced from garlic. In general, heat and age both reduce the effectiveness of the allicin. Eating raw garlic benefits people with high blood pressure. Crushing, chopping, or chewing raw garlic releases an enzyme called alliinase, which leads to the formation of allicin. Both dried and raw garlic are thought to provide a person with the most allicin content. Cooked garlic tastes great. That being said, cooking garlic is thought to reduce the allicin potential of the garlic since heat can reduce its effectiveness. Since some people cannot handle the pungency of garlic, they may vomit from the strong smell and taste. Garlic juice might be the solution. To make it, simply peel each 10 or more bulbs of garlic. Place them into a food processor and create a garlic puree. Strain the mixture through a small bowl with a strainer or mesh sieve. Pour the puree into a glass container, and refrigerate to chill. Homemade garlic oil can be produced by extracting the oil from crushed garlic cloves. You can cook with garlic oil or add a little to drinks or smoothies. Garlic supplements are available in various forms, such as tablets, oils, powders, aged garlic extract, and pure allicin. Garlic supplements are considered better than other forms of garlic since they contain high amounts of the active compounds. Studies suggest that aged garlic extract is effective and tolerable in the treatment of uncontrolled high blood pressure. What is the best dosage of garlic? The general recommendation for fresh garlic is 2 g to 5 g; 2 g to 5 g for garlic oil; 0.4 g to 1.2 g for dried garlic powder; 300 mg to 1,000 mg for garlic extract; and preparations equal to 2 mg to 5 mg of allicin. Garlic is also best stored at room temperature, while it should be kept dry to prevent the garlic from sprouting. In a study published in the Pakistan Journal of Pharmaceutical Sciences in 2013, researchers gave hypertensive patients either a blood pressure medication, a placebo, or various dosages of garlic, including 300 mg, 600 mg, 900 mg, 1,200 mg, and 1,500 mg of garlic daily. All the garlic dosages reduced blood pressure as well as the blood pressure drug. Also, high doses of garlic saw a greater reduction in blood pressure with longer durations of treatment. A systematic review found that most studies showed that garlic’s antihypertensive effect corresponded with dosages of 600 mg to 900 mg of garlic daily. You may also be able to reduce blood pressure with 0.3 g to 1.5 g of dried or fresh raw garlic on a daily basis. Since most garlic cloves are three grams, this is about half a garlic clove each day. You may reduce your blood pressure even more with greater consumption. Although there are many health benefits associated with garlic, there are precautions that should be taken before using garlic for hypertension. In general, garlic can increase bleeding risks, since it is a natural blood thinner. Consult your doctor before consuming raw garlic when taking blood thinners or an ACE (angiotensin converting enzyme) inhibitor blood pressure medication. Stop taking garlic at least two weeks before having surgery. Long term use of garlic extracts is not recommended, since it can cause other side effects. For those with gastrointestinal problems, raw garlic can irritate the GI tract. Eating too much raw garlic can also cause a burning sensation in the mouth or stomach, heartburn, gas, nausea, bad breath, and diarrhea. Those with ulcers should avoid raw garlic. The more garlic consumed will increase these side effects. Raw garlic can also cause severe skin irritation if used on the skin. Garlic extract is also not recommended for pregnant or breastfeeding women; however, garlic is thought to be safe as food. Garlic should also never be given to children in large doses. Consult your doctor or other health professional for the right dosage of garlic or garlic extracts for high blood pressure. Also, speak with your doctor before consuming raw garlic if you’re taking medications such as cyclosporine, isoniazid, birth control pills, non-steroidal anti-inflammatory drugs (NSAIDs), and HIV/AIDS (human immunodeficiency virus/acquired immune deficiency syndrome) medications. So, is garlic good for high blood pressure? Some of the most powerful reported garlic benefits include improving the health of diabetics, fighting and preventing cancer, and reversing heart diseases in its early stages, while it is especially proven to reduce high blood pressure. The antihypertensive effect of garlic is associated with its antioxidant and bioactive sulfur content, especially S-allylcysteine and allicin. Studies and larger systematic reviews show that garlic extract is more effective than a placebo for reducing blood pressure in hypertensive patients. Garlic can be taken as raw and dried garlic, cooked garlic, garlic juice, garlic oil, and garlic supplements like powders, tablets, oils, and aged garlic extract and pure allicin. Consult your doctor before taking any supplement, including any form of garlic. Bayan, L., et al., “Garlic: a review of potential therapeutic effects,” Avicenna Journal of Phytomedicine, Jan. to Feb. 2014; 4(1): 1-14; PMCID: PMC4103721. “High Blood Pressure Fact Sheet,” Centers for Disease Control and Prevention; https://www.cdc.gov/dhdsp/data_statistics/fact_sheets/fs_bloodpressure.htm, last accessed Nov. 15, 2017. Balch, J., et al., Prescription for Natural Cures: A Self-Care Guide for Treating Health Problems with Natural Remedies Including Diet, Nutrition, Supplements, and Other Holistic Methods (Hoboken: John Wiley & Sons, Inc., 2004), 110-111. Murray, M., M.D., et al, The Encyclopedia of Natural Medicine (New York: Atria Paperback, 2012), 666-667. 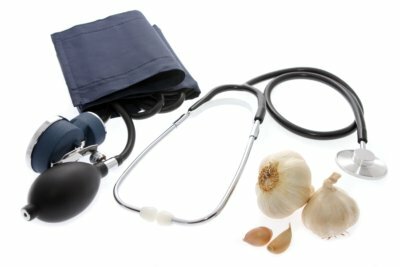 “How Consumption of Garlic Affect Blood Pressure,” Health Community Key, Oct. 17, 2017; http://healthcommkey.org/consumption-garlic-affect-blood-pressure/. Ried, K., et al., “Aged garlic extract lowers blood pressure in patients with treated but uncontrolled hypertension: a randomized controlled trial,” Maturitas, Oct. 2010; 67(2): 144-150, doi: 10.1016/j.maturitas.2010.06.001. Ried, K., et al., “Potential of garlic (Allium stivum) in lowering high blood pressure: mechanisms of action and clinical relevance,” Integrated Blood Pressure Control, 2014; 7: 71-82, doi: 10.2147/IBPC.S51434. Ried, K., et al., “Effect of garlic on blood pressure: A systematic review and meta-analysis,” BMC Cardiovascular Disorders, June 2008, 8: 13, doi: 10.1186/1471-2261-8-13. “Regulate Your High Blood Pressure Using Garlic Daily,” VisiHow; http://visihow.com/Regulate_Your_High_Blood_Pressure_Using_Garlic_Daily, last accessed Nov. 16, 2017.